I’m convinced Alice Springs is Australia's best kept secret. It’s come a long way from its humble origins as a desert telegraph outpost, without losing touch with its rich native roots. A surprisingly busy hub smack dab in the middle of the country, Alice has made a reputation as being the perfect jumping-off point for exploring the outback. But you don’t need to venture far; there's plenty to do right in town. We were welcomed with warm greetings (and cookies) at the DoubleTree Alice Springs, which is quite the oasis with its crimson mountain views, a heated outdoor pool, and a resident peacock named Andrew. No wonder it's consistently rated the best accommodation around. To kick off our introduction to the Red Centre, we paid a visit to Desert Park, which partners with local aborigines to educate visitors about the desert environment and its inhabitants, including the native peoples who lived alongside the unique flora and fauna of Central Australia. Our tour also included a trip to the nocturnal house, home to rare creatures like bilbies and quolls, and a bird show, which afforded us some close encounters with a black kite, bush stone-curlew, and tawny frogmouth, among other beautiful birds. Doug, our Arrerntye tour guide, walked us through the winding park while teaching us about his ancestors’ culture. His people have lived for millennia in these harsh conditions, moving with the seasons and using smoke farming to encourage plant regeneration. He also shared creation stories (commonly referred to as “dreamtime,” which isn’t a very tactful way to describe their religious beliefs) about how the local mountains came to be, and showed us the complex system of “skin” groups, or tribes, that dictated compatibility for courtship. By the time our tour had finished, we were left feeling a deep sense of respect for this rich culture, the oldest (surviving) in the world. 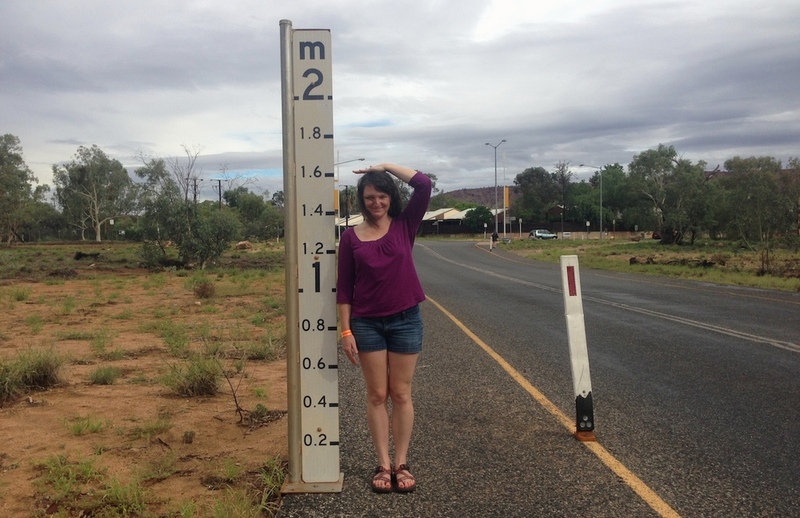 After grabbing lunch and waiting out the rain at the Watertank Cafe, a hip eatery inside an old plant nursery, we walked to the Alice Springs Reptile Centre. Turns out, Central Australia has more reptiles per square kilometer than anywhere else on earth, which is part of the reason why we decided to pop in for a quick look. But the Centre quickly became one of our favorite visits of the whole trip; all it took was meeting their friendly goanna (a huge lizard) named Ruby, who spends her days wandering around the building and enjoys a good back rub. We loved her, and she features prominently in our video of Alice Springs. As if we hadn’t already had enough fun, our visit coincided with one of the centre’s reptile shows, offered three times daily. We got to meet and hold Suzie Q, the 3-year-old olive python. She wasn’t quite as cute as a koala, but she was definitely more cuddly. She clung her smooth body around our torsos and gently repositioned herself to get comfortable. I think in that moment, our lifelong fears of snakes slipped away. Not really but wouldn’t that have been cool? We also met a blue-tongued skink, which had a thick body and tiny legs. I tried to turn on the charm, but she refused to kiss my cheek. 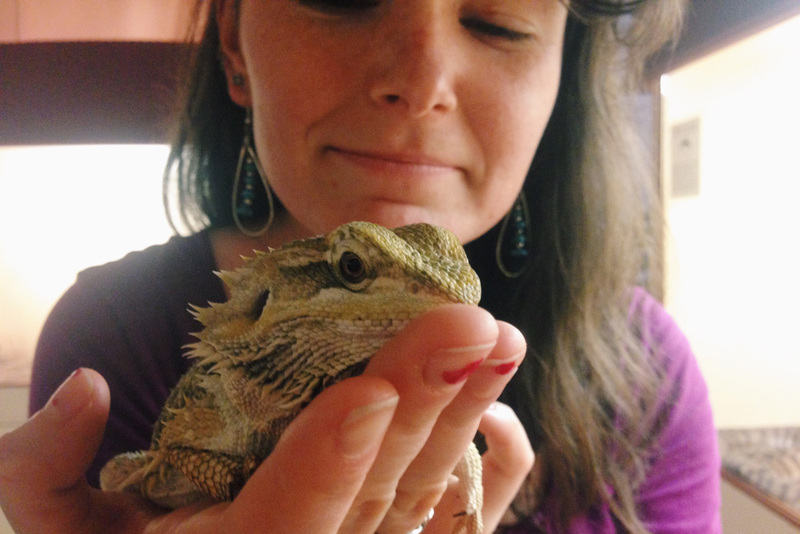 The best encounter was our last, with Beardy, as I liked to call the adorable bearded dragon. The small lizard was spiky yet soft, and happily perched itself on our hands. Kristen and I wanted to take him home. 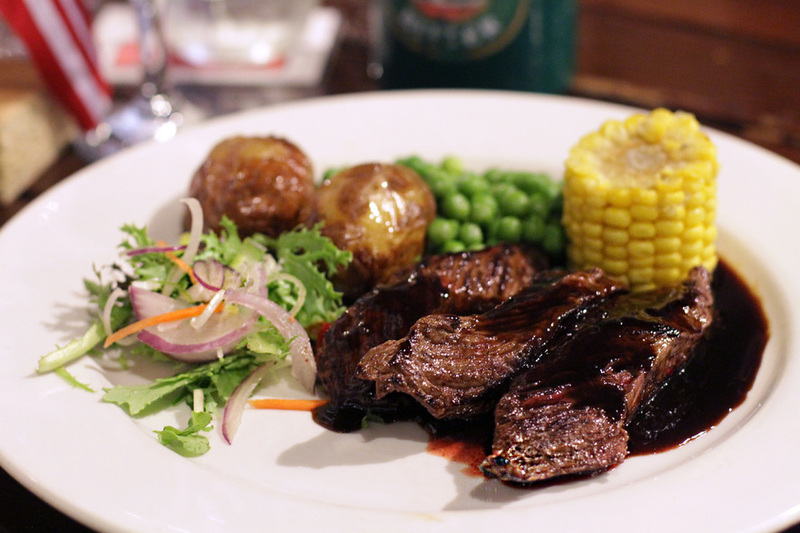 To get ourselves even more acquainted with Australia’s native animals, we headed to a classic outback saloon called The Overlanders Steakhouse. It is a must for adventurous eaters looking to taste Australian classics like kangaroo, emu, crocodile and camel (OK, that last one isn't native but there are a million of them living there). Not only is the restaurant's food delicious, the rustic decor proudly displays cattle driving relics that reminded us of Hugh Jackman's "Drover" from the movie Australia. Oh, and you get a flag of your country placed on your table so that everybody knows everybody else’s origin (we were happy to be the only Americans). To the happy Norwegian lady who made the rounds that night: we salute you. With our thoroughly enjoyable and informative day drawing to a close, we realized that unlike other places we visited in Australia, Alice Springs seems to have maintained a deeper connection with its native heritage. It’s a place that has embraced its history and nature, rather than erase it with high-rise buildings. Most of the people we met, locals and tourists alike, seem to have a respectful grasp of the native significance of the surrounding mountains, even knowing some native words for the flora, fauna, and natural landmarks. A visit to Alice almost certainly means an education in native culture and history, which might be why it is such an enchanting place. We only experienced a fraction of what Alice has to offer, but it felt more meaningful than anywhere else in the country. Even though I’m keen on spreading the word, I could see why some might want to keep it a secret. The DoubleTree by Hilton Hotel Alice Springs has a super friendly and helpful staff, plus one of the town's best restaurants, Hanuman, in the lobby. Be sure to say hello to Andrew the Peacock, but don't let him get too close to your cookies! 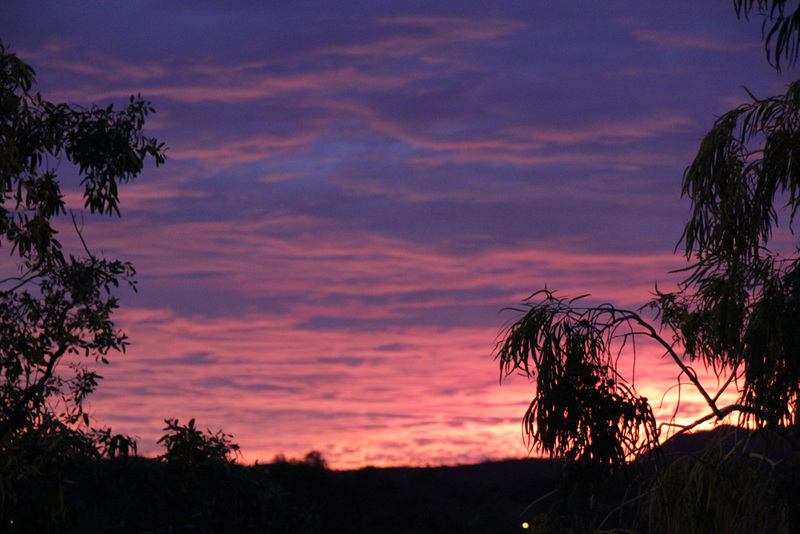 Alice Springs Desert Park is open from 7:30am to 6pm daily, with an entry fee of $25 per adult. Budget at least a couple of hours to explore the grounds and the nocturnal house. Don't miss the Wild Bird Show, held at 10am and 3:30pm at the nature theater. Alice Springs Reptile Centre is open from 9:30am to 5pm daily, with an entry fee of $16 per adult. Budget at least an hour and a half. Don't miss the reptile show, at 11am, 1pm, and 3:30pm, for an opportunity see some of these amazing creatures up close. Who knows? You might not be that afraid of snakes after all. The Watertank Cafe is a great place to grab lunch and recharge, with delicious toasted wraps, free wifi, and playful decor (it used to be a plant nursery, so there's plenty of greenery). Even though it's a bit off the beaten path, it's well worth the trip. Open from 9am to 3pm (2:30pm on Sundays). The Overlanders Steakhouse is a lively spot to grab a drink and sample some classic outback fare. Definitely get the sampler. If you're lucky, you might even catch a staff wobbleboard show. Or just ask for a demonstration. Disclosure: I'm traveling Australia for my DTour of a Lifetime sponsored by DoubleTree by Hilton.